Curry came to Japan via tins of English vindaloo, and today on the mainland it's made like a French-style veloute from a roux and stock. Enterprising chefs from the northern island of Hokkaido, however, have come up with their own version designed to show off the region's excellent vegetables. 1. Heat your oven to 190C (fan forced). Toss the vegetables in two tablespoons of the oil and arrange on a baking tray lined with baking paper. Scatter with salt and bake the vegetables uncovered for 25-30 minutes until they are roasted and tender. 2. Season the chicken marylands with salt and brown, two at a time, in a little oil in a large pot and set them aside. Add the onion, garlic and ginger to the pot and fry for about two minutes until softened (add a little more oil if you need to). Add the spices, tomato passata and bay leaf and fry for a further minute until fragrant. Add the water or stock, sake, soy sauce and mirin and bring to a simmer. Return the chicken to the pot and simmer for 30 minutes, until the chicken is tender. Stir through the basil leaves. 3. 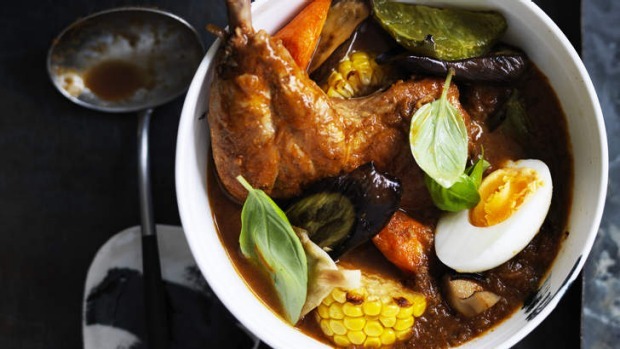 Place one chicken maryland in each bowl and add the roasted vegetables and half an egg. 4. Pour over the curry soup and serve with thick-sliced, buttered bread or steamed rice.